PhilBoxing.com >> News >> List of Articles >> Recah Trinidad: Nietes, humble legend, now a proud star! Nietes, humble legend, now a proud star! The fight was close and entertaining, but after Donnie Nietes scored a split decision win over tough Kazuto Ioka of Japan on Monday, there were those who readily wondered if there would be a rematch. That was all to be expected, mainly after the New Year’s Eve fight in Macau finished with no display of full dominance from the two warriors. There were sharp exchanges, but neither of the two had been caught in peril of falling or toppling over. A draw also remained a big possibility as the ring announcer started to announce the scorecards. Nietes, with a welt under the right eye, was early to grab at victory, raising his hands in triumph after the final bell. Ioka, unscathed and fresher, waited keenly in his corner. Two judges scored it 118-110 and 116-112 for Nietes; a third gave it 116-112 to Iota. 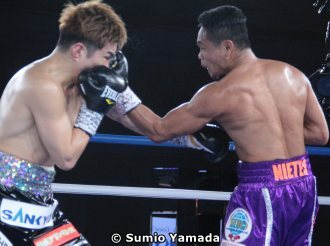 Nietes, patient and methodical, moved ahead with sharp counterpunching in the first six rounds. Ioka however adjusted starting the second half, cutting (the ring) sharply with deft footwork. He pushed harder in the eighth and rode on better ring generalship to win the 9th round. Ioka had his biggest moments scoring from outside in the 10th but the vastly experienced Nietes dug deep to stand his ground and score at close range with deciding counters in the final two rounds. The slim victory gave Nietes his fourth world title, the vacant WBO super flyweight title, thereby joining Manny Pacquiao and Nonito Donaire Jr. as the only Filipino boxers to win four titles in separate world divisions. Dong Secuya, founder and chief editor of Philboxing.com, wrote from ringside that Nietes was able to cement his legacy as one of the greatest boxers to come out of the Philippines.